Lake Powell was formed with the construction of the Glen Canyon Dam in 1963, on the Colorado River in Page, Arizona. It is the second largest man-made lake in the United States and is 187 miles long with 96 major side canyons and a coast line of approximately 1960 miles--more than the west coast of the U.S. from Seattle to San Diego. The scenery is almost indescribable with towering rock formations rising majestically straight up out of the water. Lake Powell is located within Glen Canyon National Recreational Area (GCNRA) on the Arizona-Utah border. It's located in the heart of The Grand Circle, so named because of the concentration of our country's most fantastic National Parks and Monuments, i.e., Grand Canyon National Park, Bryce Canyon National Park, Zion National Park, Arches National Park, Canyonlands National Park, Canyon de Chelly National Park, Capital Reef National Park and Monument Valley. Rainbow Bridge National Monument is located approximately 50 miles up-lake from Glen Canyon Dam in Forbidding Canyon. This awesome span is the world's largest natural bridge standing 290 feet high. 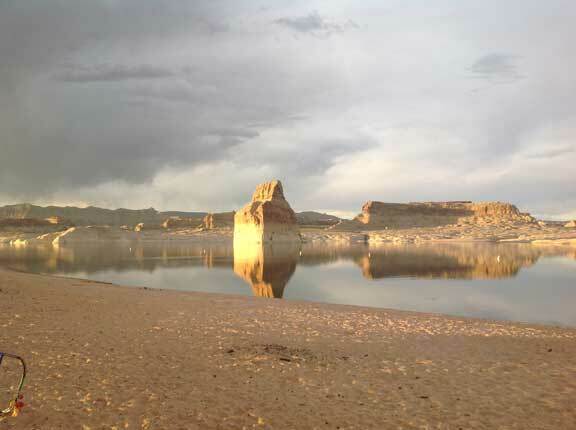 Lake Powell holds approximately 8.5 trillion gallons ofwater and summer time water temperatures approach 80 degrees. It is home to many game fish such as Walleye, Western Pike, Large and Smallmouth Bass, Stripers, Catfish and Bluegill.